When an individual has proteinuria at any stage of CKD, a suffix “p” should be added. This is of importance, as proteinuria is associated with an increased cardiovascular risk and is an independent marker of progression of the disease. When an individual in stage 5 CKD is on dialysis, a suffix “d” should be added. This is to help identify individuals on dialysis. When an individual has received a transplanted kidney, a suffix “t” should be added. This is to help identify a transplanted individual. Such individuals have kidney damage with normal kidney function , i.e. GFR ≥ 90mls/min/1.73m2. 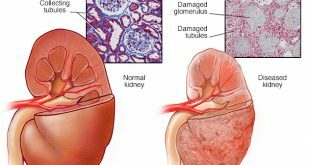 Kidney damage is diagnosed by urine abnormalities, abnormal findings on a kidney biopsy or abnormal radiological abnormalities. Such individuals have a severe reduction in renal function and should be seen and managed by a nephrologist. They have GFR values of between 15-29mls/min/1.73m2. At this point, individuals are often counseled for therapy to replace the inadequate function of the kidneys. Individuals are offered either haemodialysis or peritoneal dialysis or living related transplantation if there is a suitable kidney donor . Preparations for access creation are also discussed. Individuals who opt for haemodialysis require a vascular access to be created at least 6 weeks before it can be functional. Individuals who opt for peritoneal dialysis need a catheter to be placed into the abdominal cavity 2-4 weeks before the commencement of peritoneal dialysis. Such individuals have established kidney failure. They have GFR ≤ 15mls/min/1.73m2. These individuals require permanent renal replacement therapy to sustain life.